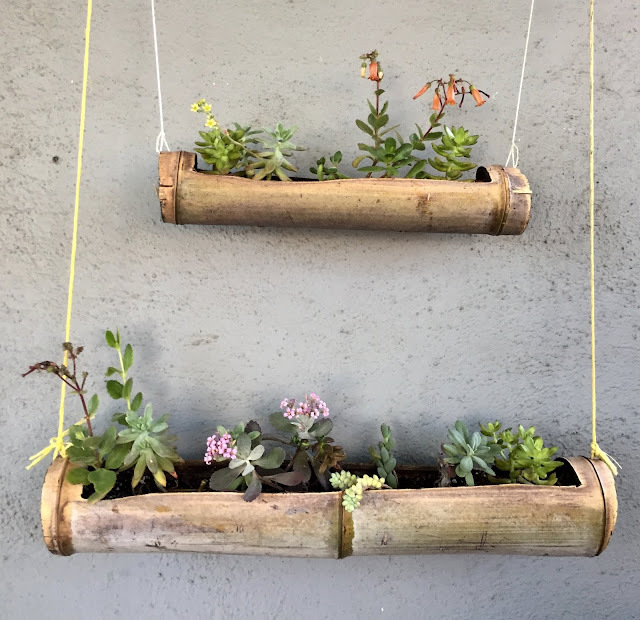 Last summer I had seen a hanging bamboo planter at a nursery that looked so cool that I wanted to make some! I had been collecting succulents for awhile and had a good selection to use. In autumn I got around to asking my friend Louise who works at The Huntington Library & Botanic Gardens for two big pieces of bamboo. Thanks Louise! It's good to know people who work at botanic gardens :-) One was so big and heavy I had to cut it right then and there to make it fit in my truck. Good thing I had a little folding saw in my work basket. I hauled them home. A few weeks later I cut them into varying sizes on the segments. Rick helped me by cutting out the top for planting and drilling holes for hanging. Filled with cactus mix I then planted them with succulents, some were cuttings and some were rooted. I scrounged nylon string for hanging that I found at a job that was trash. I sold a few at the SoCal Horticulture December meeting and gave some as Christmas gifts. What was left I found places to hang here at our house. These two I hung from the roof on the bare wall of the garage. They'd probably look better hanging from chain. But that hasn't happened yet. The little one hangs below our mailbox by the front door. These two are hanging on the little chain link fence next to the unattractive AC unit in the backyard. I think they'll just get better when the succulents grow and cascade. Yay for upcycling! I like those Aprille - Clever you! Sorry Aprille!!! It was your idea on that hanging bamboo. Thank you for your help on dressing up my deck this summer!!! !